Family Farm Grows with New Calf Kelly! 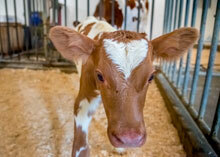 The Northwestern Mutual Family Farm welcomed a new member to the family this past month! Ayrshire calf, Kelly, was born on Sept. 8 to mom Ruby. Weighing in at 86 pounds, Kelly is active and enjoying her time in the farm. Zookeepers note that Kelly is very playful, with a heart-shaped fur spot on her forehead. 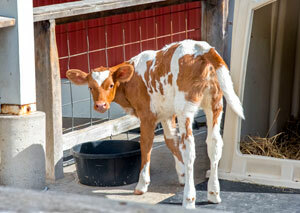 Kelly currently receives 15 pints of milk each day, in addition to hay and a calf-starter grain. She has toys to play and interact with, and as she grows older, will receive further enrichment. Ayrshire cattle are distinguished by their red and white color. Shades of red vary on cows from light red to dark red. Ayrshire cows can grow to weigh up to 1200 pounds. Kelly can be seen outside in the calf hutch, when the weather is nice, and currently rotates the outdoor exhibit with black and white Holstein calf, Lacey. Make sure to swing by the Northwestern Mutual Family Farm to give Kelly a warm welcome!